All-Pets employs a staff of diverse, caring veterinary professionals who always have your pet's care in mind. Our team always has great stories and advice to share. Check out our blog for regular updates and helpful tips! Kathy Berge, DVM | Owner. Dr. Kathy Berge graduated from Iowa State University’s College of Veterinary Medicine in 1989. She started working at All-Pets in 1990. Dr. Berge has a passion for Bernese Mountain Dogs, showing and breeding under the kennel name Ahquabi. She has owned Berners since 1984, longer even than her veterinary career. If you have question or concerns about Bernese Mt. Dogs and similar large breeds, she is your vet! Dr. Berge has been married to her husband, Paul, for 33 years. Paul is a local freelance writer, actor, and film director. Previous gigs include a radio drama show, Rejection Slip Theater, and acting as the host of Side Roads on Iowa Public Television’s Living in Iowa. Paul also works as a flight instructor and owns Butter Cow Films, LLC. Dr. Berge and Paul have one daughter, Emily, who works in writing/publishing in New York City. They also live with 5 dogs and 3 cats. Rachel recently celebrated 10 years of providing care at All-Pets Hospital! She joined us in 2008, graduated from Des Moines Area Community College with a degree in Veterinary Technology, and passed her State and National Boards in 2010 as a Registered Veterinary Technician. Rachel's professional interests are in canine behavior, dentistry, and anesthesia. She is certified in the Karen Pryor Academy's Dog Trainer Foundations Course and is very familiar with effective force free and clicker training. Rachel regularly attends the Iowa Veterinary Medical Association's annual meeting to learn the latest recommendations for low stress handing of dogs and cats in the hospital setting. She spent several years teaching dog training classes at Paws and Effect, a service dog program in Des Moines. Rachel and her husband, Matt, have a Dalmatian named Cloud, a Labrador named Barret, and a large flock of chickens. When not training or treating dogs, Rachel enjoys cycling and tending to her land and bee hives in Knoxville. Tacy’s first visit to All-Pets Hospital was in 2004 for a job shadowing day. In 2017 she officially joined our team as a receptionist and is now the one who cheerfully greets you at the door and will make any excuse she can to pet the patients. 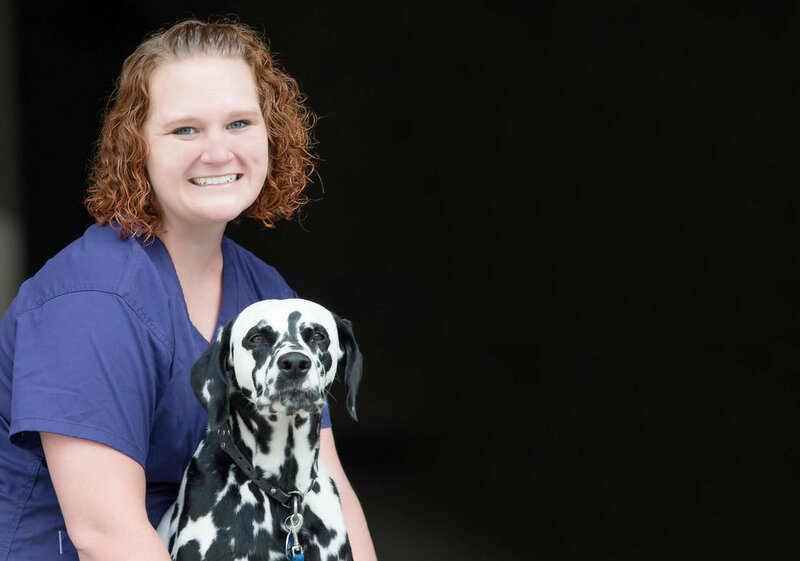 Through years of training at our clinic, she now fills the role of veterinary assistant as well and frequently attends veterinary conferences/events to keep up to date on current medicine and techniques. She is also in charge of our social media, so be sure to check out our Facebook and Instagram to see the adorable pictures of our patients she posts! Tacy spends her free time dog-sitting, going to the gym, binge-watching TV shows like Parks & Rec or Game of Thrones, and spending quality time with her yellow lab, Seri. Sylvia came to us from the Animal Rescue League of Iowa in July, 2016. During her time at the ARL, as both a volunteer and an employee, she taught Dog Companion/Dog Body Language classes to new volunteers, co-taught Puppy and the Good Manners classes, and was a member of the behavior assessment team. She was also heavily involved with the ARL’s Pets for Life Community Outreach program which provides needed services to pets in the Des Moines Area whose owners could not otherwise provide needed care. This experience has been extremely helpful, as All-Pets currently is one of the only clinics in Des Moines to work with this program. Sylvia spends her spare time with her children, grandchildren, and 2 dogs (Benny and Sadie). Valerie started working as a groomer for All-Pets Hospital in 2015. She has over 5 years of grooming experience, and loves helping animals look and feel their best. Valerie takes the time needed to make your animals feel comfortable while being groomed. Customer satisfaction is high on her list of priorities and she strives to have your pet look it’s absolute best. In fact, she was recently awarded the title of Best Groomer in the Des Moines Area by The Des Moines Register. Valerie lives with her husband, Mike, and her two children. Also sharing their home are 5 cats. Most of Val's spare time is spent pet sitting and attending her kids' sporting events. Alley joined us in August of 2018. We were excited to have her so that we could have more availability in our groom schedule. She has quickly proven herself to be a great groomer, and an excellent addition to our All-Pets team. In her spare time, you can find her relaxing at home with her husband Jake and her lab-mix, Butters. Carol has been employed at All-Pets Hospital for over 30 years. Carol is the weekend kennel assistant taking care of boarders and hospitalized patients. She always gives each and every animal the special attention it needs on weekends and holidays. Her love of animals is shown each and every day. Carol is actively involved in the community assisting with local elections, volunteering for various church and other civic activities. Carol lives in Des Moines and shares her home with cats Z, Smoke, and Ougi. She also has an adopted a Shar Pei mix, Reeses, from the Animal Rescue League of Iowa.